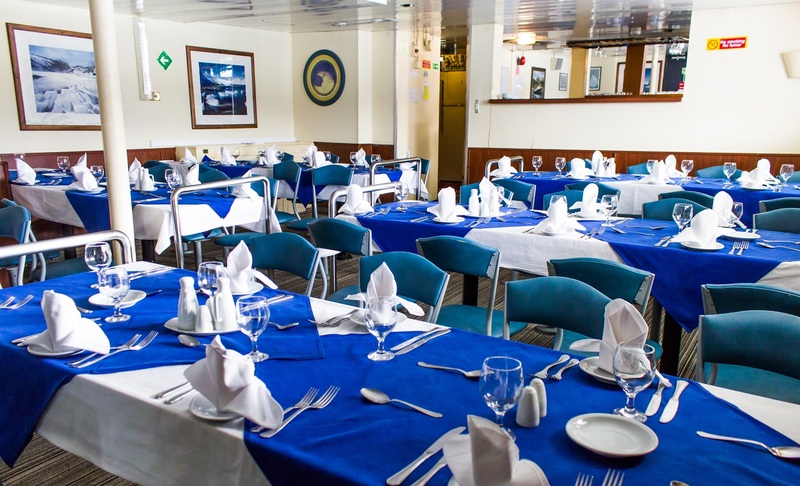 Enjoy the ultimate expedition cruise to South Georgia, Antarctic Peninsula & South Shetland Islands aboard the MV Ushuaia. 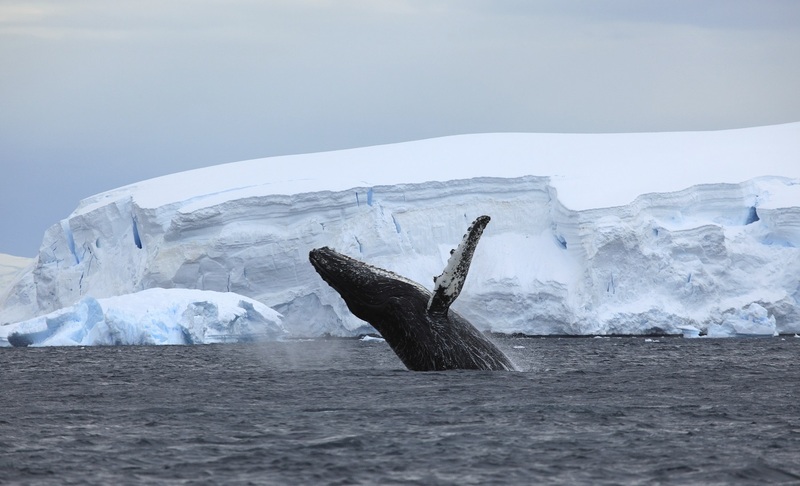 Visit the last pristine region of the world, landing at penguin colonies and research stations and get up close and personal with various different species of whales, seals, penguins and sea birds via our fleet of zodiac craft. West Point Island lies off the most north-westerly point of mainland West Falkland (Malvinas). The attractive settlement sits on the edge of a small harbour on the eastern side of the Island, in the lee of Black Bog Hill and Michael´s Mount. 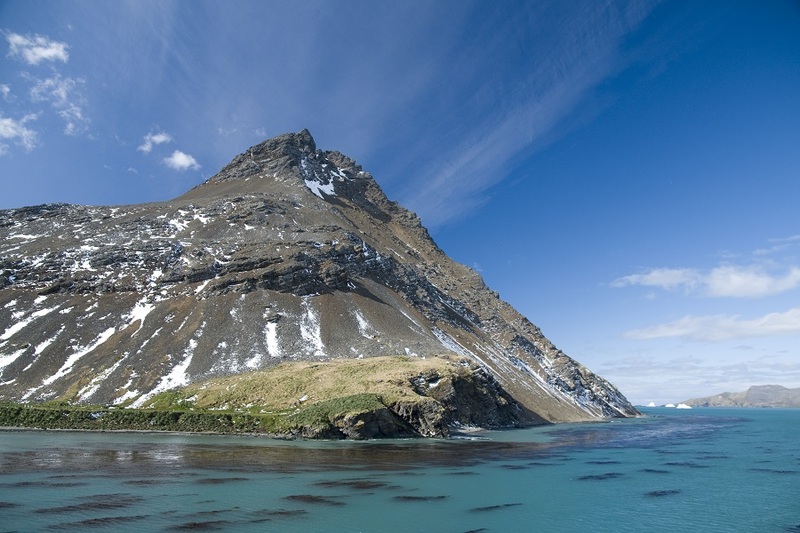 The valley between these two peaks rolls over the centre of the island to the dramatic Devil´s Nose, one of the Island´s main attractions. From here visitors are treated to splendid views of Cliff Mountain, the Island´s highest point at 1,250 ft (381 m), and the highest cliffs in the Falklands. This is where we will encounter a vast colony of Rockhopper Penguins and Black-browed Albatrosses, nesting together in close vicinity. Carcass Island lies to the north-west of the Falkland archipelago (Malvinas). A mature tussac plantation covers much of the lower ground below Jason Hill to the east. The availability of abundant cover and the absence of cats, rats and mice throughout the island have made for a spectacularly large population of small birds, which is one of Carcass Island´s most delightful features. Gentoo and Magellanic Penguins do also nest here. Peale´s and Commerson´s dolphins come frequently close to the shoreline to get a glimpse of the visitors as well. At the settlement with its beautiful gardens, we are invited to enjoy tea and cookies with the locals. Overnight we will sail around the northern islands of the archipelago in easterly direction to reach the capital, Stanley, in the following morning. In the morning hours we will have time to explore the quaint little town of Stanley and its wonderful Museum, souvenir shops and pubs. The town was established in the early 1840´s. Isolation and the weather conditions made life hard, but progress was gradual and punctuated by the extremely eventful times of involvement in two world wars. For those who are more interested in the outstanding wildlife the Islands have to offer, you do not even have to leave town to enjoy it. Southern Giant Petrels often fly close to the shoreline. The endemic Falkland Steamer Ducks abound on the shorelines while Kelp Gulls can often be seen flying together with Dolphin Gulls. The less obvious but frequent visitors to Stanley area are Black-crowned Night Herons, Red-backed Hawks and Peregrine Falcons. Turkey Vultures are regularly seen on top of any prominent building. Many pairs of Upland Geese frequent the park and it might be nice to take a stroll around the gardens of town to see some of the singing birds as well. In the early afternoon it is time to set sail, heading for South Georgia. South Georgia will come into sight! Though extremely isolated, it has amazing scenery ranging from high mountains and mighty glaciers to deep fjords and low-lying grassland. Sometimes called the "Serengeti of the South", Salisbury Plain is a wildlife site without parallel. 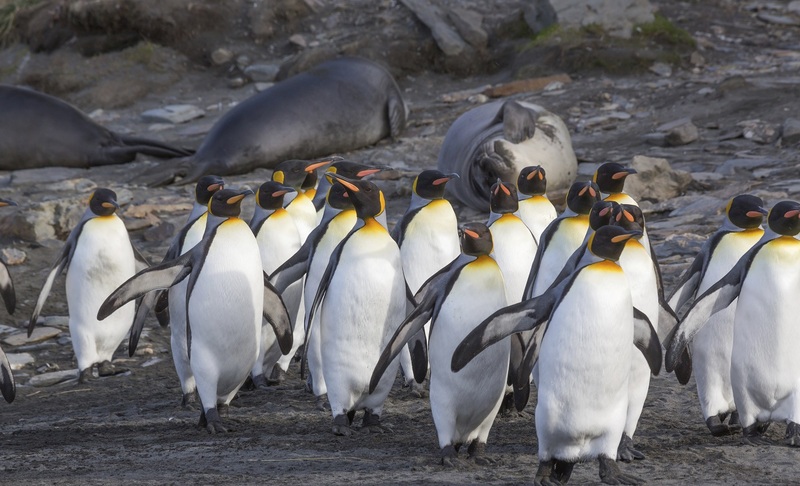 Several large glaciers provide a dramatic backdrop for the tens of thousands of King Penguins that nest in the tussac grass of this remarkable ecosystem. The wide beach makes for excellent walking as we visit the colony, where we are literally surrounded and delightfully outnumbered by throngs of curious, gentle penguins. 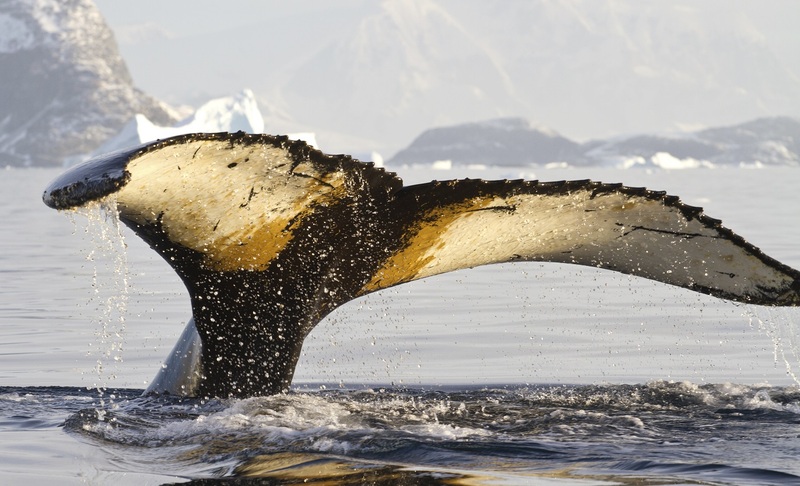 Elephant and fur seals also abound, as well as Southern Giant Petrels and the occasional wandering Gentoo Penguin. Prepare for an awe-inspiring experience, as the elephant seals are giving birth on the beaches. Prion Island is a beautiful tussac-grass covered islet. 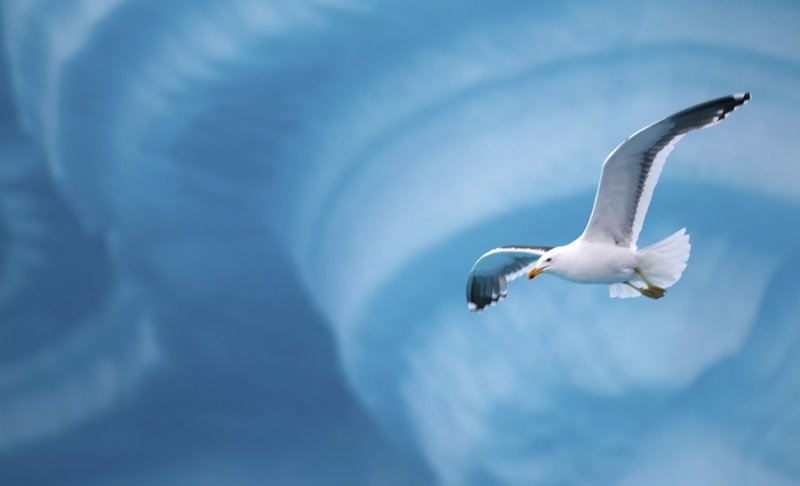 If we are lucky we will get the opportunity to see a breeding colony of Wandering Albatross on top of it. We will climb to the summit on a wooden boardwalk, which takes us close to their nests and offers comfortable viewing platforms. Grytviken lies within King Edward Cove, a sheltered harbour tucked between Hope Point and Hobart Rock on the western shore of Cumberland East Bay. 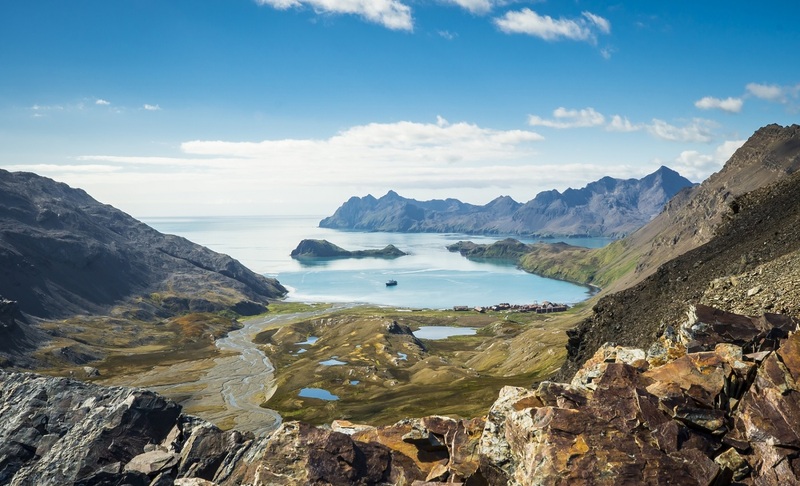 The rusting ruins of the Grytviken whaling station are situated on a level plain at the head of the cove, backed by steep hills and mountains. Now the site of the South Georgia Museum, the station remains a focal point of interest for many visitors, as does Sir Ernest Shackleton´s grave in the nearby whaler´s cemetery and his memorial cross on Hope Point. The scenery in this area is exceptionally beautiful even by South Georgia standards: the glaciers and snow covered peaks of the Allardyce Range - Mt. Sugartop, Mt. Paget, Mt. Roots, Nordenskjöld Peak, Mt. Kling and Mt. Brooker - form a magnificent backdrop to the cove, and the views from King Edward Point in particular, must be among the finest on earth. Situated 9km east of Cumberland East Bay on the eastern shores of Barff Peninsula, Godthul is a 3km long inlet that lies between Cape George and Long Point. Gentoo Penguins are abundant on the tussac plateau and Light-mantled Sooty Albatrosses echo off the natural cliff amphitheater that encircles the harbour. A floating factory ship serviced by two whale catchers was stationed here each summer between 1908 and 1929. A small shore depot supporting the whaling operations was established close by the stream in the southeast corner of the harbour, and the rusting barrels, wooden shed and boats are fascinating relics of the whaling era, as is the impressive collection of whale and elephant seal bones scattered along the beach. 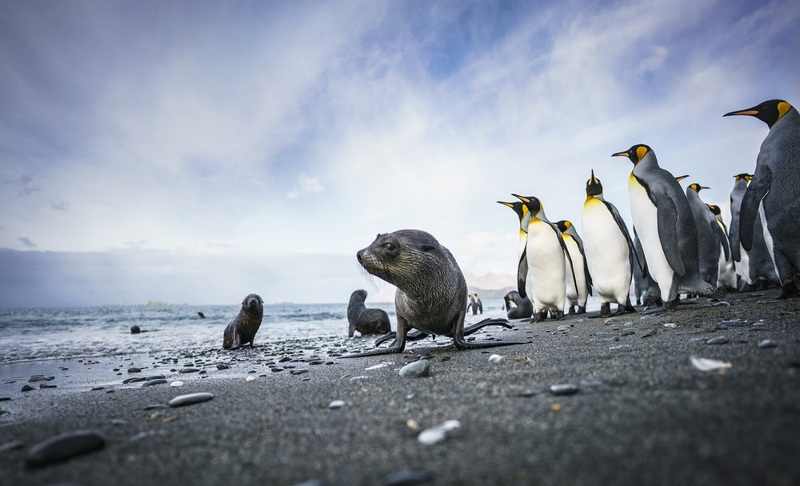 The surf beaten coastline at St. Andrews Bay runs north-south in a 1.86 mile (3 km) long uninterrupted sweep of fine dark sand, covered in penguins and seals and bounded in the interior by the Cook, Buxton and Heaney Glaciers. 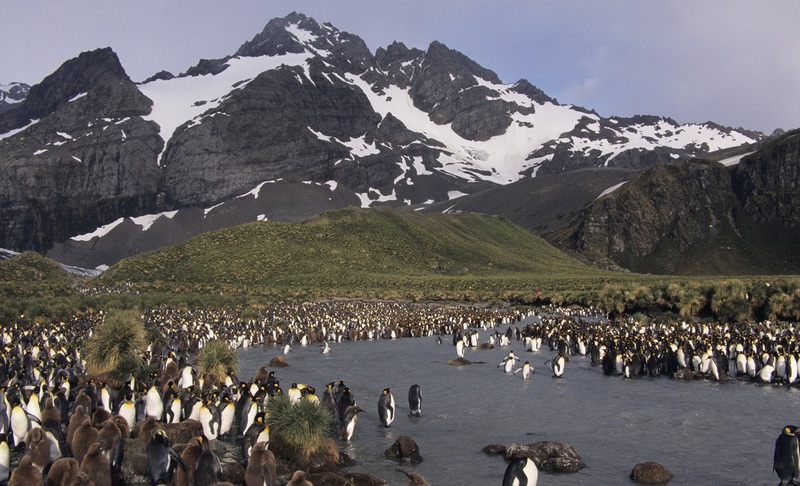 The bay hosts the biggest colony of King Penguins on South Georgia. Early in the season, the beach is also carpeted with fur and elephant seals. Such a large assemblage of wildlife attracts an entourage of persistent and voracious scavengers. Sheathbills dart in and around the penguin colony. Cape Petrels nest in a small number on the cliffs north of St. Andrews Bay. Leopard seals patrol the rocks at this end of the beach too, hunting for penguins along the edge of kelp beds. A few White-chinned Petrels and Light-mantled Sooty Albatrosses nest on the tussac slopes. Brown Skuas and Antarctic Terns breed on the outwash plain and scree slopes at the north end of the beach, defending their nest sites with their characteristic noise and vigor. Cooper Bay is found at the southeast extremity of South Georgia. There is a wealth of wildlife at this site, in a spectacular setting. Chinstrap, Gentoo and maybe one or two Macaroni Penguins dot the tussac slopes and there are plenty of fur seals on the beaches. 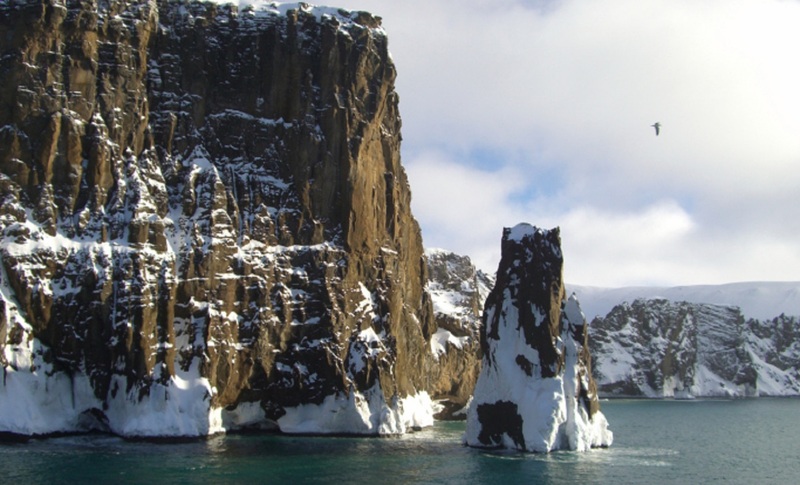 Fascinating volcanic rocks tower over small fjords, giving a stunning invitation for a thrilling zodiac cruise to watch wildlife from the waterfront. Drygalski Fjord is also located in the far south east of the island. The glaciers found in this dramatic fjord have retreated significantly in recent decades, but they still remain one of the most striking features of this coastline, particularly the Risting and Jenkins Glaciers. 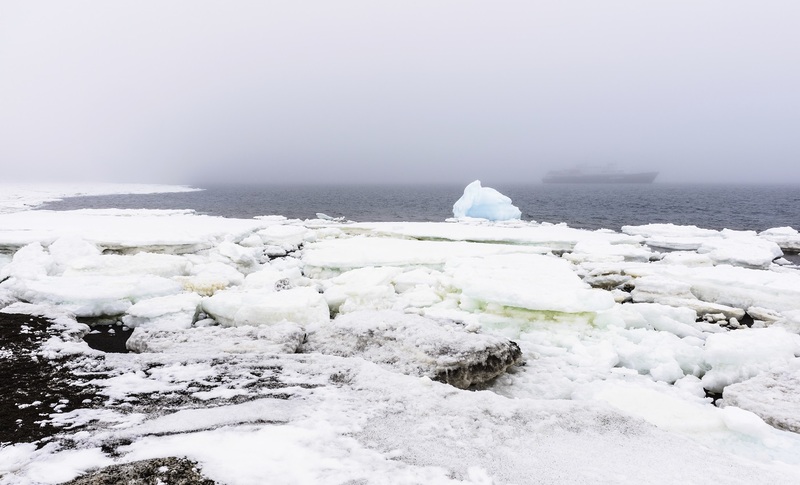 With a little luck, we might see the glaciers calve and witness the birth of a new iceberg from on board the ship. 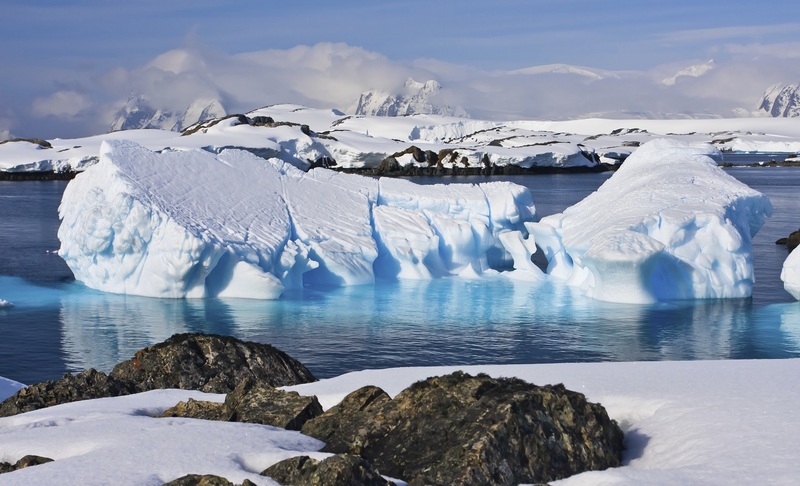 Our expedition team will prepare you for our experience in the Antarctic Peninsula and South Shetland Islands. 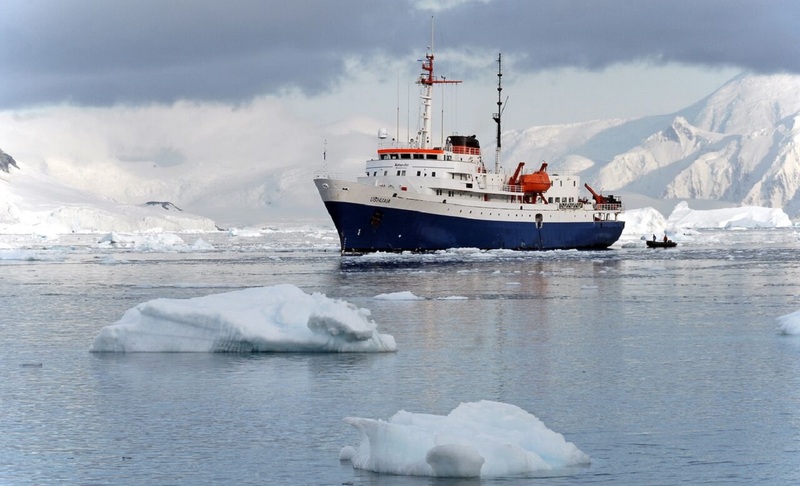 We will try to sail the passage to the east side of the Antarctic Peninsula, which traverses the Antarctic Sound and runs northwest-to-southeast. 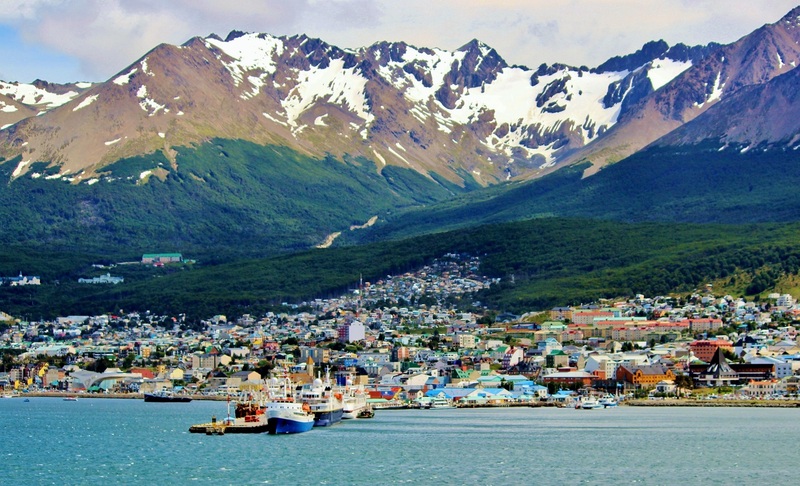 Hope Bay and the Argentine Station Esperanza are located on the western side of the Sound. Brown Bluff, a promontory on the Tabarin Peninsula, is located south of Hope Bay. Both of them might be possible landing sites. 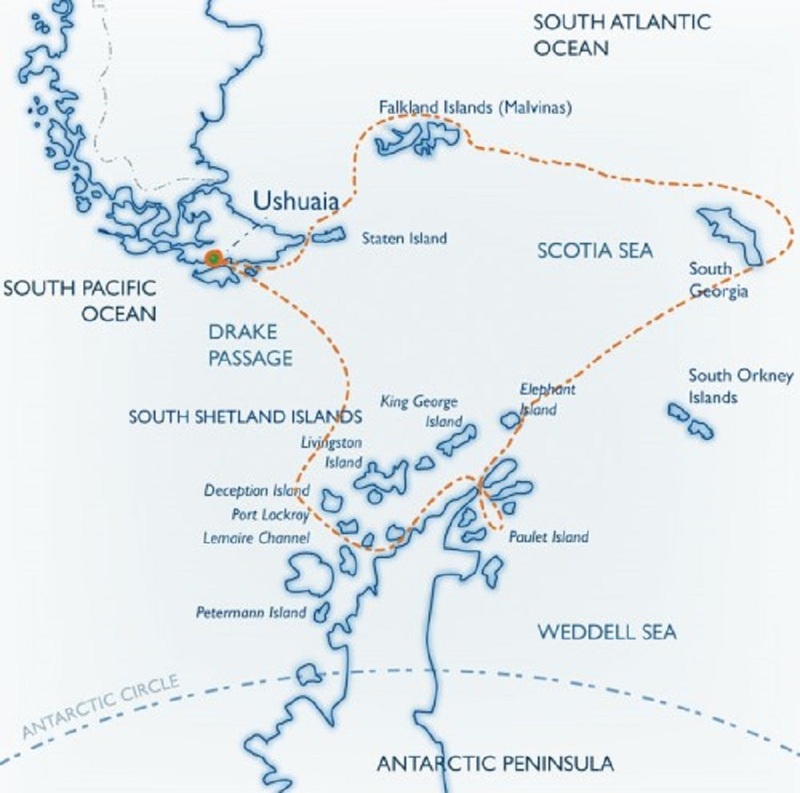 The Weddell Sea represents the center of the Peninsula´s Adélie Penguin population. Deception is the largest of three recent volcanic centers in the South Shetlands. Sailing through the narrow passage into the flooded caldera of Deception Island is truly amazing. Once inside, the rising slope of the black, cinder-covered volcanic rim can be walked uphill to a rather spectacular vantage point. 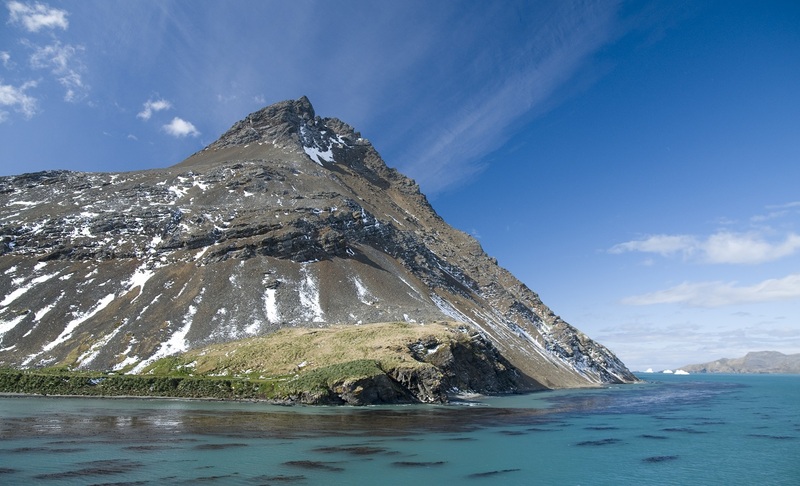 This crescent-shaped island, in the entrance of Moon Bay between Greenwich and Livingston Islands, is home to Chinstrap Penguins in breathtaking surroundings. 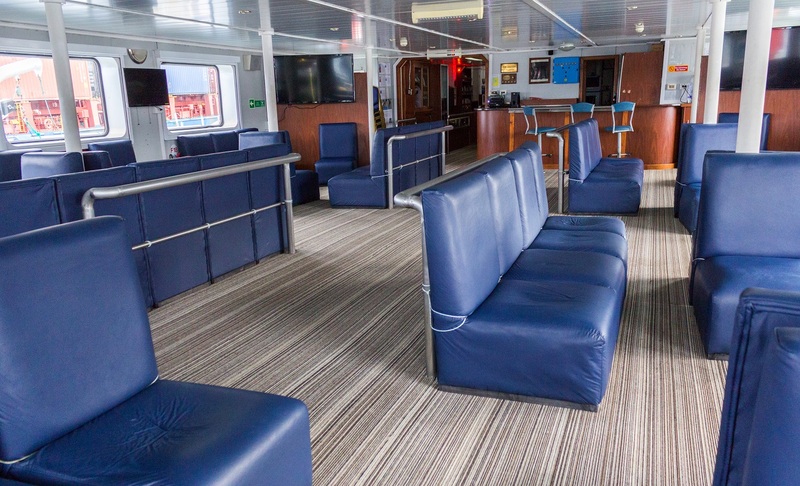 Located on deck E, triple outside cabin, three lower berths, one window & private facilities. 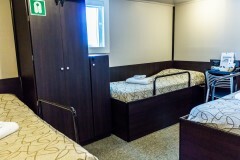 Located on deck E, outside standard twin cabin, one upper and one lower berth, one porthole window & semi-private facilities. 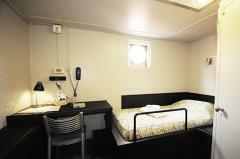 Located on deck E, outside standard plus twin cabin, two lower berths, one window & private facilities. 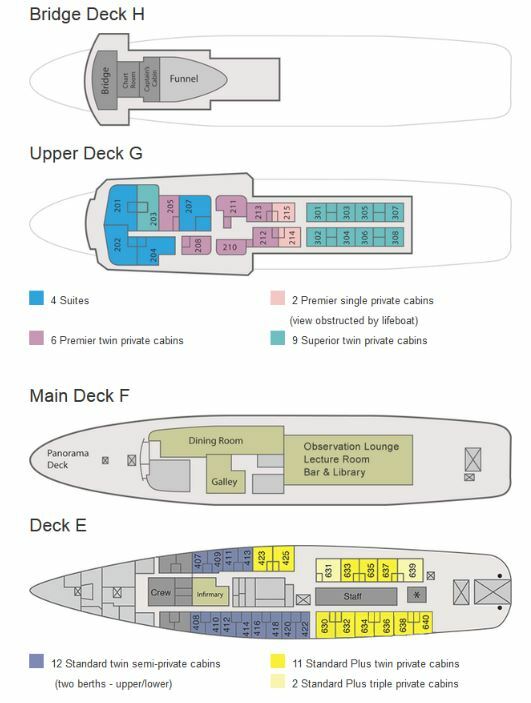 Located on the upper deck G, outside premier twin cabin, two lower berths, one window & private facilities. 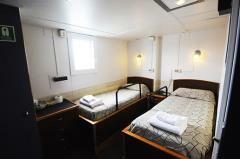 Located on the upper deck G, outside premier single cabin, one single bed, one porthole window & private facilities. 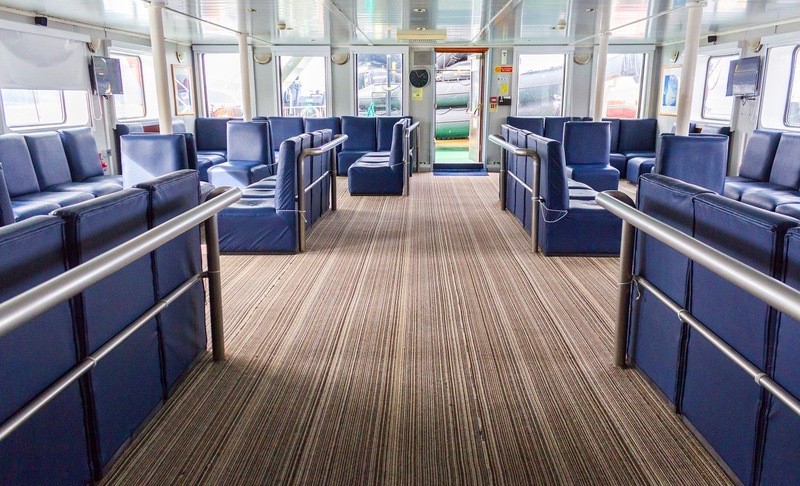 Located on the upper deck G, outside superior twin cabin, two lower berths, one window & private facilities. 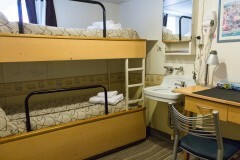 Located on the upper Deck G, two lower single beds, one sofa bed, private facilities, lounge, TV, DVD player, fridge, one window in the bedroom and in the sitting area.